I promised you a happy puppy should I get some reviews last week and I was not denied, so here it is. Awww. That looks like Merlin when he was a pup. Glad you got more reviews! 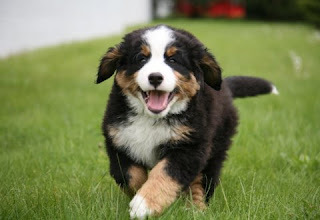 That's a Bernese Mountain dog, isn't it? My in-laws have one and he stayed about that size for one day. Now he's huge! I have no idea what kind of dog this is. I just know it's the happiest puppy image I could find.